It is evident that Beijing has bought Khan’s deafening silence on the persecution of Uyghur Muslims through the billions of dollars invested in China Pakistan Economic Corridor (CPEC) and military sales to Pakistan. Khan’s subservience to Chinese money was on full show during the groundbreaking ceremony for the Baluchistan Health Complex in Quetta this week. At the event, Khan spoke highly of CPEC and reassured Baluchis not to be concerned about Chinese increasing influence in the region . Baluchis have every right to be anxious about the pervasive pace of Chinesezation of Baluchistan, which threatens to marginalize their rights and suffocate them. Khan is not alone in turning a blind eye towards the immense suffering of Muslims in the region. On January 4th 2019, Khan’s Federal Minister for National Food Security and Research, Sahibzada Mehboob Sultan, joined the Burmese ambassador in Islamabad to celebrate Myanmar’s independence day and partook in a cake cutting ceremony. Did it not occur to Sultan that the Burmese junta has been engaged in a protracted campaign to exterminate Rohingyan Muslims and expel them from their homeland? . The genocidal crimes of Myanmar’s government are well documented, but Khan’s government saw no harm in embracing the butchers of Rohingyans. In February, Foreign Minister, Shah Mehmood Qureshi, seemed to upend Pakistan’s longstanding policy towards the Jewish entity and expressed his country’s desire to normalize relations. Qureshi said, “We wish all the best for Israel, we have many friends in the region and we would like you to join them.”  Musharraf—the main architect of Pakistan’s foreign policy post 9/11— echoed Qureshi and called for better relations with the Jewish entity. It is unsurprising, then, to find Pakistan intentionally muzzling its criticism of the Jewish entity’s recent punitive actions in Palestine. Perhaps the most fickle of Khan’s statements have been over India’s suppression of Kashmiris. Khan has been found simultaneously condemning and supporting Modi’s harsh policies towards Kashmir. Khan’s peace overtures towards Modi serve to underscore the perception that Khan is more interested in getting Modi re-elected than easing the oppression of Kashmiris. 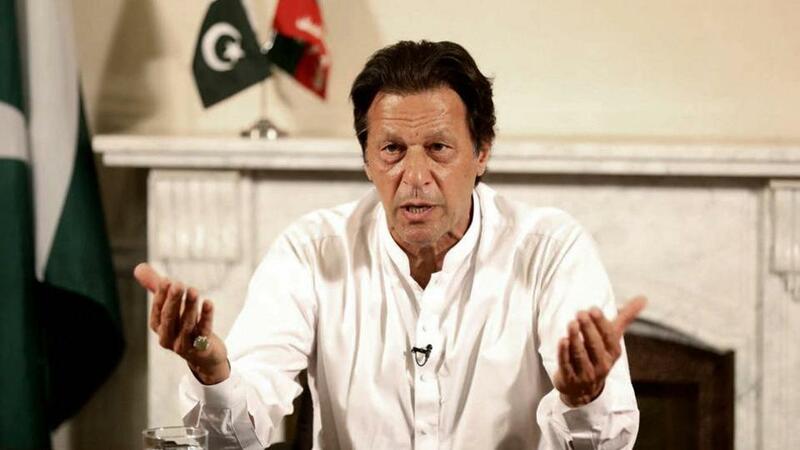 Khan ascended to power on the mantra of making a clean break from the past, but hitherto his foreign policy has hardly detoured from the Musharraf years. Had Khan been sincere in his belief about changing Pakistan into the riyasaat of Madina, the very least he could have done was to put greater pressure on these countries to reverse their policies of oppressing native Muslims through cutting diplomatic relations and threatening severe military retribution. [1, 2, 3] CNN (2019). Pakistan’s Khan dodges questions on mass Chinese detention of Muslims. [online] CNN. Available at: https://edition.cnn.com/2019/03/28/asia/imran-khan-china-uyghur-intl/index.html [Accessed 30 Mar. 2019]. Dawn (2019). Pakistan’s Khan dodges questions on mass Chinese detention of Muslims. [online] Dawn. Available at: https:// www.dawn.com/news/1472622 [Accessed 30 Mar. 2019]. The Nation (2019). Myanmar Independence Day celebrated. [online] The Nation. Available at: https://nation.com.pk/13-Jan-2019/myanmar-independence-day-celebrated [Accessed 30 Mar. 2019]. MSN.com (2019). Pakistan FM wants ‘normal ties with Israel. [online] MSN.com. Available at: https://www.msn.com/en-xl/asia/pakistan/pakistan-fm-wants-normal-ties-with-israel/ar-BBTT2aZ [Accessed 30 Mar. 2019]. MSN.com (2019). Build relations with Israel to counter India: Musharraf [online] MSN.com. Available at: https://www.msn.com/en-xl/asia/pakistan/build-relations-with-israel-to-counter-india-musharraf/ar-BBTY4qZ [Accessed 30 Mar. 2019]. Next PostWhat is the Khilafah’s Media Policy?